Industrial chemical-based agriculture, which produces the vast majority of US food crops, is actually destroying the soil that makes the growing of food possible in the first place. This is not true in other countries. Worldwide, 70 percent of the food is grown in backyards or small farms. That number is likely well under two percent in the US. It is my goal to motivate, inspire, and encourage tens of millions of people to start growing their own food so we can radically change these numbers. You likely know I have been active in supporting the labeling of GMOs and I think this is great, but even better would be to eliminate their market and one of the ways we can do this is by growing our own nutrient-dense food in our yards or community gardens. However, I strongly believe that there are far simpler and less expensive ways that would allow most of you to effortlessly grow your own food. And in the coming years, I will seek to inform you on how to easily and inexpensively do that. One 2006 study found that 60 percent of Indian farmers using GE seeds could not recoup their investment, causing more than 250,000 farmers to commit suicide. Many can’t even feed their own families. And yet farmers are increasingly left with few options, as Monsanto and other chemical technology companies are buying up seed companies, effectively eliminating the competition. Proponents of genetic engineering claim GE seeds is the most effective way to feed the world, by producing plants unnaturally equipped with internally-produced insecticides, or with genes making them resistant to chemical herbicides. Some are advertised as drought resistant, and/or higher yield producing. But, the truth turns out to be quite different. GE plants produce foreign proteins making them highly allergenic, and more often than not, they actually require more water to thrive, and therefore end up producing less than conventional seeds. In the end, everything and everyone suffer more because of the “chemical marvels” of modern agriculture, and the corporate control of our food supply. Additionally, the industrial farming practices that use GE seeds waste massive amounts of water and contribute to large losses of our precious topsoil. Simple inexpensive alternatives can virtually eliminate the need for irrigation and create, rather than decimate topsoil. As GE plants increasingly take over the major food-producing areas of the world, including the US, China, India, Argentina, and Brazil, reduced soil fertility has a high probability of leading to worldwide famine on a scale never previously seen. The mechanisms for this loss of soil fertility are just beginning to be understood, and what was recently only theory has inched closer to reality as science shines more light on the consequences of introducing genetically engineered organisms into the soil. Special genetic elements (vector DNA) are present in all GE plants. This vector DNA enables unrelated microorganism species to mate, but can also be transferred to soil microorganisms. Soil fertility depends on the presence of a diverse blend of microorganisms, all serving different roles in balancing and optimizing the soil. But when unrelated species mate, the soil ecosystem loses diversity, which is proven to damage fertility. The video features Peter Proctor and Sarvdaman Patel, two biodynamic farmers working in India. Over the past 15 years, Proctor has watched a slow but steady grassroots revolution occur, with biodynamic farms spreading across India’s countryside. It’s important to realize that the entire food chain is connected, from soil, plant, and insect health, all the way up to animal and ultimately your health. That is why it is so important to pay attention to the details as supporting the diverse set of soil microbes at the bottom of the food chain ultimately supports your health. Biodynamic farming is a spiritual-ethical-ecological approach to agriculture that was initially developed by Dr. Rudolf Steiner1 (1861-1925). This approach can provide far superior harvests relative to conventional chemical based agriculture. It provides superior crops both in volume and increased density of nutrients, and biodynamic farms are completely self-sustaining. Biological gardening has been one of my passions for the past few years, and I have read many books, every issue of ACRES USA for the past few years, and interviewed many experts in this area. So far, I’ve attempted to apply this by converting about 50 percent of the ornamental landscape around my home to an edible landscape. Over these past few years, I have applied many different strategies to improve plant growth, such as vortexed compost tea, rock dust powders, magnetic structured water, ionized water, biochar, many types of foliar sprays, and ground covers like woodchips. I believe many of the biodynamic farming principles are valid and useful, especially the application of structured water, discussed in the video. However, I firmly believe the vast majority, if not all of the benefits of biodynamic farming, can be achieved far more easily and less expensively. The video is an interesting demonstration of this conclusion. How many of you would have the time out of your day to learn this complex system, and more importantly, apply it? Additionally, in the featured video, you will see that they are still using the plow, and there is no question in my mind that this is an incorrect and highly counterproductive method. Most experts I know firmly believe no-till agriculture is the best approach. The last thing you want to do is disturb the soil. I believe this is because it disturbs soil microbes, especially the fungi. You might not realize that 70 percent of the soil microbes responsible for plant health and plant communication are fungi, and tilling will disrupt these mycorrhizal fungal filaments. I am so grateful to Paul Gautschi, whose video Back to Eden, helped me understand the value of using wood chips. I struggled for years seeking to unlock the puzzle of growing nutrient dense food that reaches its maximum genetic potential before his recommendations. The simplicity and low cost were massively appealing for me. When I studied it more carefully, I realized it was the single best way to optimize soil microbiology with very little effort. 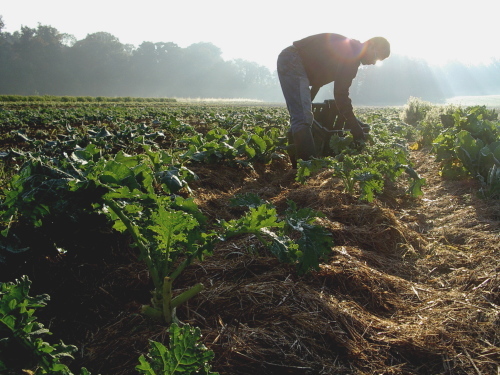 Read the full story via How to Create an Environment-Friendly Biodynamic Food System.